We did it! Thank you all so much for your generosity- because of your participation, we raised just over $1700! 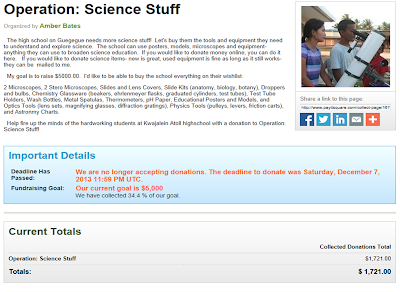 That's more than enough to purchase everything that the school had on their wish list with some left over to help buy work tables and have the air conditioning installed in the lab. I delivered the first purchases from Operation: Science Stuff the other day, and although I don't think the students were very excited to recieve the microscopes, their teachers were (pictures coming soon). I'm going to start purchasing the rest of the equipment soon and we'll be making deliveries throughout January. Thanks again for supporting the young people of the Marshall Islands!